Our modern farming and preparation techniques no longer allow grains to germinate before we eat them. Are whole grains indeed the good guys? Many people find that grains cause health problems. The following is a small list of what can happen, over time, due to eating grains ill prepared (without first soaking and sprouting them). "This is why a diet high in unfermented whole grains may lead to serious mineral deficiencies and bone loss. The modern misguided practice of consuming large amounts of unprocessed bran often improves colon transit time at first but may lead to Irritable Bowel Syndrome and, in the long term, many other adverse effects. Soaking allows enzymes, lactobacilli and other helpful organisms to break down and neutralize phytic acid." 2) There are substances in grains that have the potential to interact with the gastrointestinal tract and the immune system that can cause what is known as Leaky Gut Syndrome, a condition in which the intestinal wall becomes permeable. A permeable gut lets toxins, food particles and yeast organisms into the peripheral circulation, where they wreak havoc. 3) Grains are high in carbohydrates, which can cause your pancreas to overwork. The pancreas is a large gland located underneath the stomach. In addition to its all-important job of producing insulin to control your blood sugar levels, the pancreas produces a bicarbonate solution that neutralizes chyme acid delivered from the stomach. When the pancreas is overworked, and not kept slightly alkaline, the following can result: emotional imbalance, elevated cholesterol, weight gain and disturbed sleep. 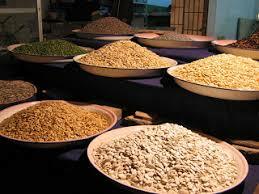 4) Grains tend to cause unhealthy organisms in your digestive tract, such as yeast, to overgrow. Having an overgrowth state of unhealthy organisms in the digestive tract can lead to very serious complications with a wide variety of symptoms including: gas, bloating, cramping, pain, indigestion, nausea, diarrhea and constipation, in addition to other bodily problems not typically associated with the colon, such as heart irregularities, numbness, tingling, joint and muscle pain, fatigue, sinus and respiratory problems, chemical sensitivities, hormonal imbalances, headaches and even vision problems. The Optimal Health Center Plan is allows you to test how you feel when you eat or do not eat different foods. You must let your body tell you what works best! We recommend following the ways of the traditional cultures and soak or ferment your grains if you decide to incorporate them into your regular diet. Almost all seeds and grains can be sprouted—wheat, rye, barley, dried beans, almonds, lentils, pumpkin or melon seeds, sunflower seeds, chia, onion, radish or poppy seeds and chick peas. Allow the seeds to soak overnight in a glass mason jar then pour off the water. Rinse them well. Invert the jar, and let it sit at an angle so it can drain and allow air to circulate. Rinse them at least twice a day, and in 1-4 days the sprouts will be ready. Rinse again, shake out excess moisture and store in the refrigerator. Sprouting your grains adds nutritional value that would not have been able to be utilized by the body prior to germination. This process increases the vitamin and enzyme content substantially and neutralizes the phytic acid that hinders digestion. They can be used lightly steamed in salads, sandwiches, soups, vegetable dishes, or ground up for breads and baked goods. Amelong, Kristina. Ten Days to Optimal Health. Madison: Prosperity Publishing House, 2006. Fallon, Sally. Nourishing Traditions. Washington: New Trends Publishing, Inc, 1999.